Large projects are no problem for our 1000-foot bulk RG59/U white braided coaxial cable. This cable is conveniently spooled inside a pullbox that allows for easy storage and dispensing. 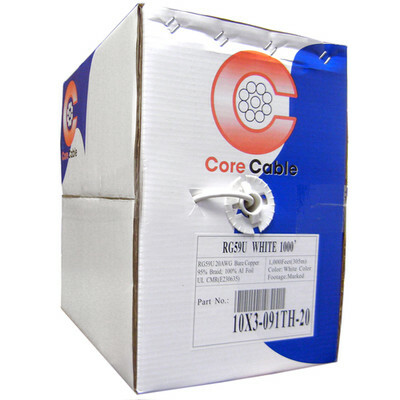 Our cable's 20 AWG, solid core copper conductor provides excellent data transfer for crystal-clear connections. Both ends of the cable are bare-ended, which means that it is ready for any project that you may need it for. It also features a 95 percent bare copper braid and polyethylene (PE) foam insulation. Trust CableWholesale for quality - this product comes with a lifetime warranty, as well as live online support.